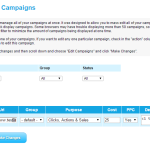 On this page you can manage all of your campaigns at once. It was designed to allow you to mass edit all of your campaigns. To get started, choose a filter and click display campaigns. Some browsers may have trouble displaying more than 50 campaigns, so it is a good idea to select the appropriate filter to minimize the amount of campaigns being displayed at one time. Each row represents one of your campaigns. If you want to edit any one particular campaign, check in the “action” column to signify to Adtrackz that you wish to edit this campaign. 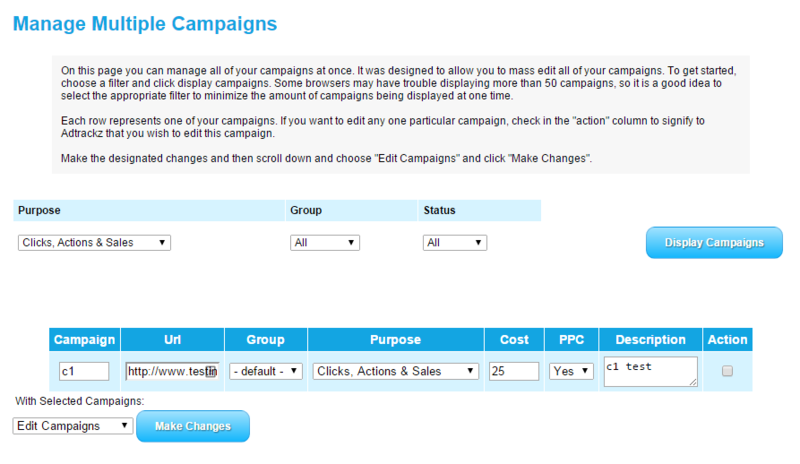 Make the designated changes and then scroll down and choose “Edit Campaigns” and click “Make Changes”.